Finished in Windsor Cherry on select hardwoods and veneers. These elegant Broadmour chiming wall clocks offer a swan neck pediment with rosettes, turned finial, and an inlaid keystone at the center. Midnight blue fixed moon phase. The dial offers a polished brass-finish with a silver chapter ring. 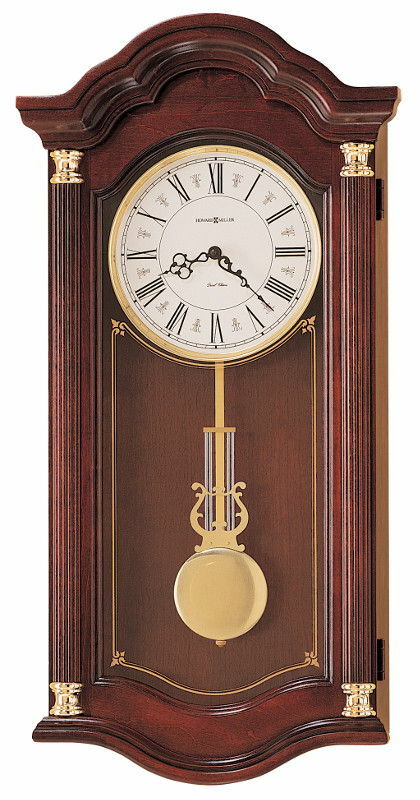 Decorative, polished brass-finished pendulum and dial are attached to the front-opening door for convenient access to change batteries and set time. Finished in Golden Oak on select hardwoods and veneers. 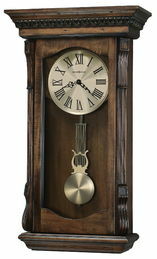 Intricately carved overlays accent the pediment and bottom profile of these chiming wall clocks. Brushed brass-finished dial features a fixed blue moon phase and decorative corner ornaments. Polished brass-finished lyre and grid pendulum is framed with gold tone detailing on the front glass. Open the front door for easy access to set time. Finished in Windsor Cherry on select hardwoods and veneers. 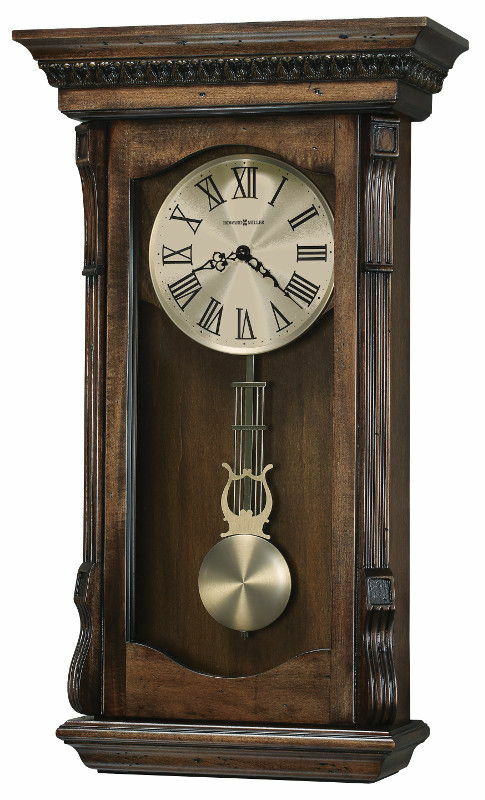 Intricately carved overlays accent the pediment and bottom profile of these chiming wall clocks. These chiming wall clocks display a Tobacco finish on select hardwoods and veneers and are heavily distressed with deep dents, gouges, and chisel markings for an aged appearance. Features a multitiered flat top and base and distinctive turned columns that frame the door. Lamb’s-wool, off-white dial with black Arabic numerals, hour markers, and hands, surrounded by a harvest brass-finished bezel. A harvest brass-finished lyre pendulum with grid hangs below. These chiming wall clocks display an Acadia finish on select hardwoods and veneers and are heavily distressed by scribes, and worm holes for a natural, rustic appearance — inspired by the natural yet rustic nature of reclaimed woods in beautiful patinas and burnished details. Featues a multitiered flat top, distinctive columns with corbels frame the door, and carved Acanthus moldings that accentuate the pediment. Circular spun antique nickel-finished dial with black Roman numerals, hour markers, and hands. An antique nickel-finished lyre pendulum with grid hangs below. 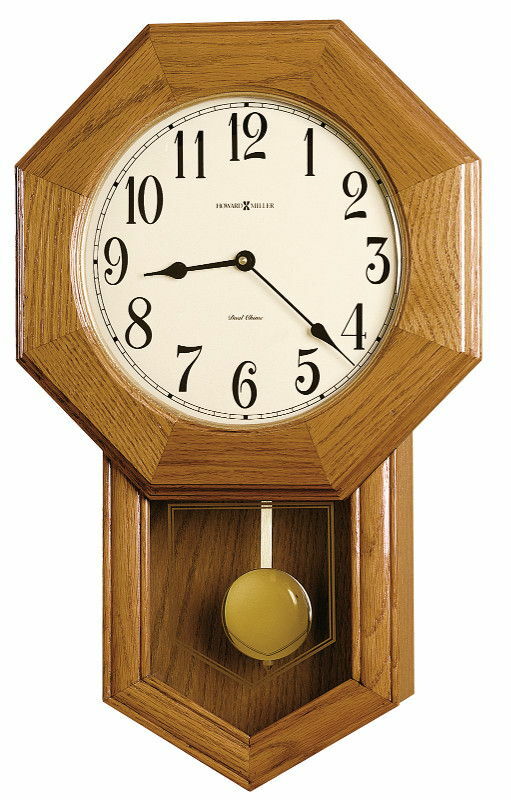 Quartz, battery-operated, triple-chime Harmonic movement plays choice of full Westminster or Ave Maria chimes with strike on the hour with 1/4, 1/2, and 3/4 chimes accordingly; Westminster chime and strike on the hour only; or Bim Bam chime on the hour only. Volume control and automatic nighttime chime shut-off option. Requires two C sized batteries (not included). Finish in Hampton Cherry on select hardwoods and veneers. 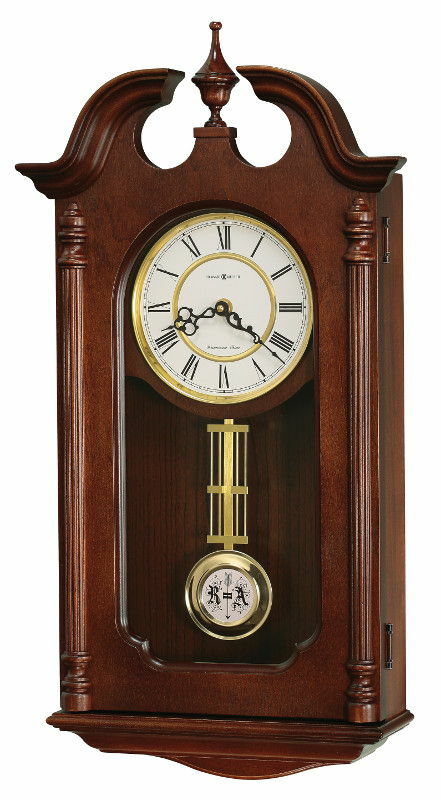 These handsome chiming wall clocks feature elaborately carved column caps and a complementing carved accent on the door. The dial has a lamb’s wool background with Roman numerals and black hands. Finished in Worn Black on select materials, hardwoods and veneers with brown accents and features Vintage Umber finished lower door panel, dial and back panel. The dial offers gold Arabic numerals on a brown and black background. An antique brass-finished pendulum may be viewed through a glass window in the front panel on these handsome chiming wall clocks. Finished in Hampton Cherry on select hardwoods and veneers. 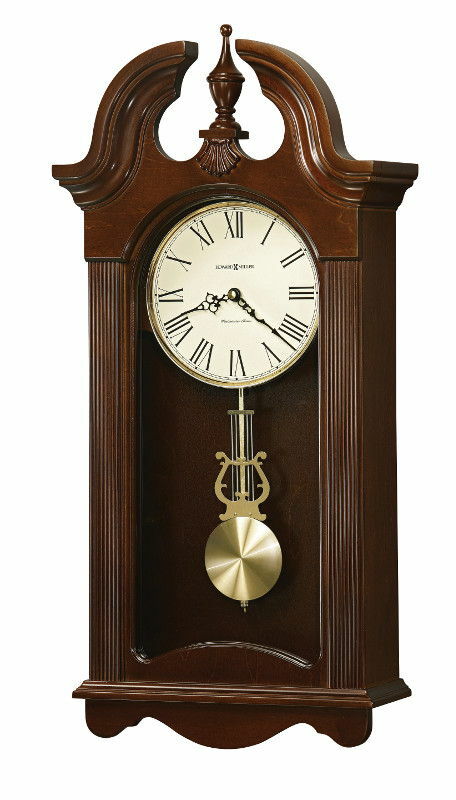 These classic chiming wall clocks feature embossed molding below the pediment, burl overlays and carved rosettes on the door. The dial features an antique background with black Arabic numerals and a raised antique brass-finished outer edge. An antique brass-finished lyre and grid pendulum complement the dial and bezel. Chimes on & strikes on the hours. These wall clocks feature a flat top pediment. Decorative carvings frame the convex glass pendulum window in the front panel, which reveals the circular antique brass finished pendulum. Aged ivory dial with aged black Arabic numerals, black spade hour and minute hands, convex glass crystal. 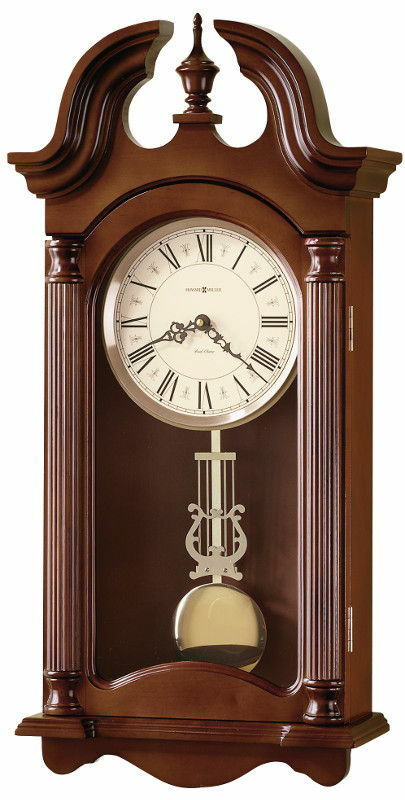 These elegant wall clocks include a quartz, battery-operated, triple-chime Harmonic movement that plays the choice of full Westminster or Ave Maria chimes with strike on the hour with 1/4, 1/2, and 3/4 chimes accordingly; Westminster chime and strike on the hour only; or Bim Bam chime on the hour only. 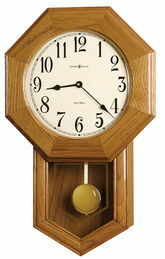 These modern wall clocks include a quartz, battery-operated, triple-chime Harmonic movement that plays the choice of full Westminster or Ave Maria chimes with strike on the hour with 1/4, 1/2, and 3/4 chimes accordingly; Westminster chime and strike on the hour only; or Bim Bam chime on the hour only. These modern wall clocks feature a white dial with black Roman numerals, a brushed nickel-finshed bezel and black hour and minute hands. A spun nickel-finished pendulum bob is suspended on a Black Satin-finished wood stick in front of a mirrored back. 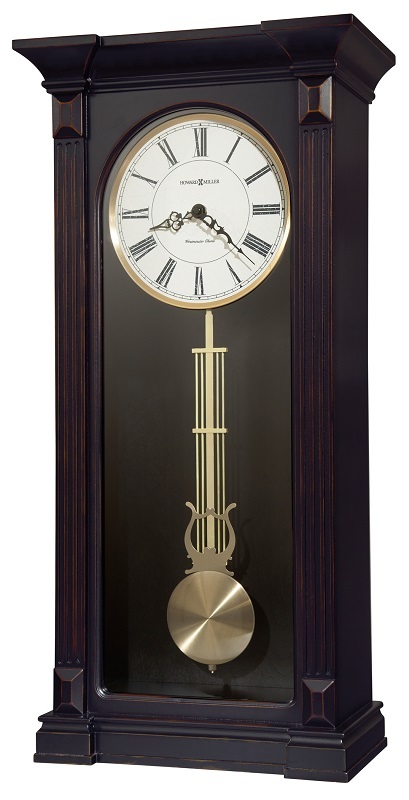 This wall clock's dial offers etched, nickel finished corner ornaments and center disc, silver chapter ring with black Arabic numerals, black serpentine hands, and fixed black moon phase. Spun nickel pendulum bob with brushed nickel lyre complement the dial. Case features carved upper columns and pediment ornament. 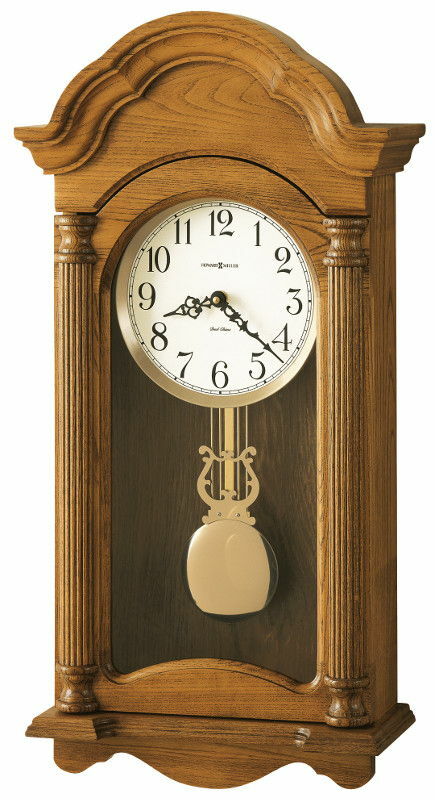 These curvaceous wall clocks feature carved accents and a turned urn finial which complement the unique style. The aged dial offers black Roman numerals and decorative black hands. The wooden stick pendulum features an antique brass-finished spun bob. 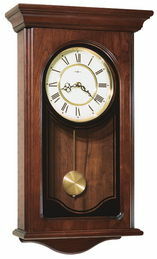 Traditional chiming wall clocks with Tuscany Cherry finish on select hardwoods and veneers. Finished in Coconut on select hardwoods and veneers. 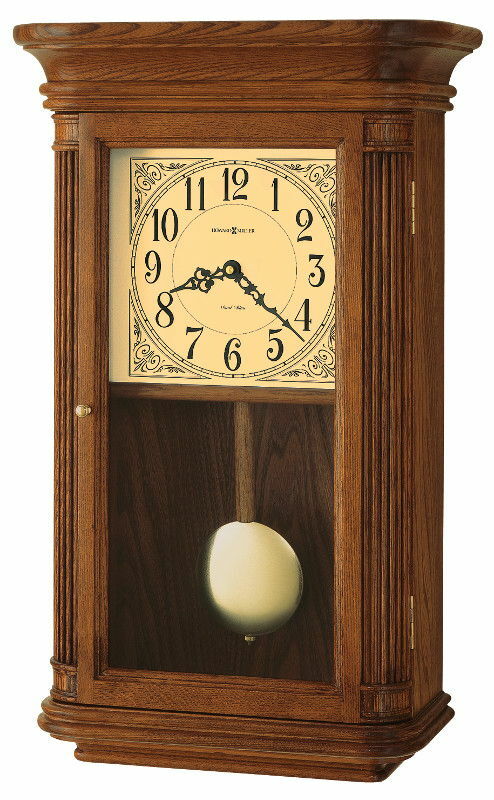 These traditional chiming wall clocks feature a shell carving on the top crown, seeded glass in the lower door, and a grooved back panel for a planked appearance. Aged dial with worn black Arabic numerals, a wood bezel, black hour and minute hands, and convex glass. Antique brass-finished pendulum bob suspended on a wood stick pendulum. Howard Miller Gerhard Wall Clock 625-502 is finished in Chocolate on select hardwoods and veneers. 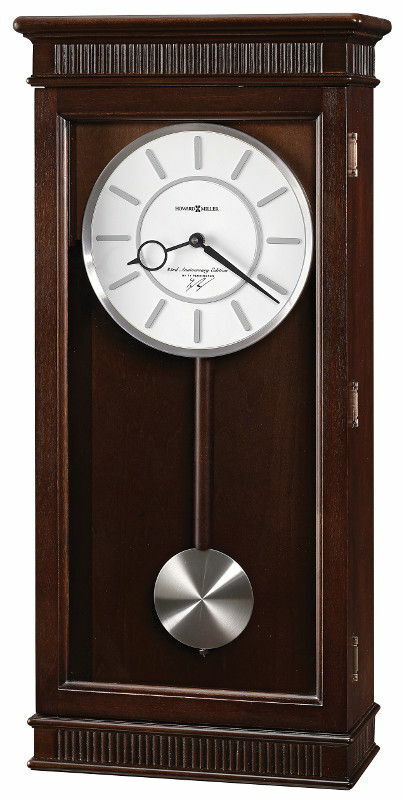 These contemporary chiming wall clocks feature a mirrored back panel and plain glass in lower door. The white dial features embossed, nickel-finished Arabic numerals and hour markers, a black minute track, a wood bezel, nickel-finished hour and minute hands, and convex glass crystal. Nickel-finished grid-style pendulum. 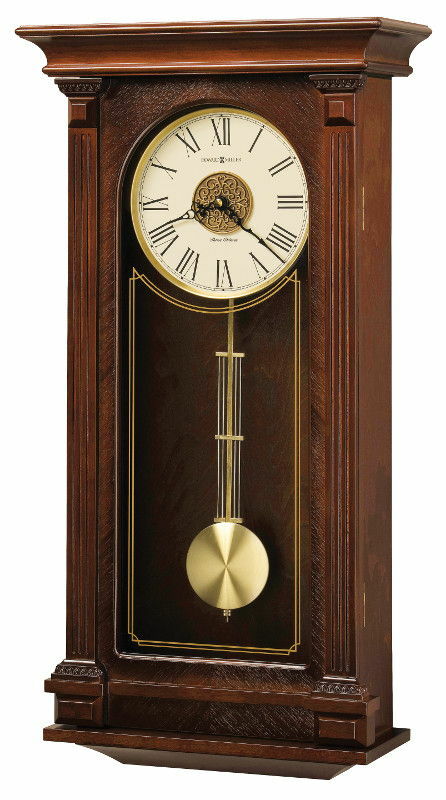 These chiming wall clocks feature a turned finial and antique spun brass pendulum. 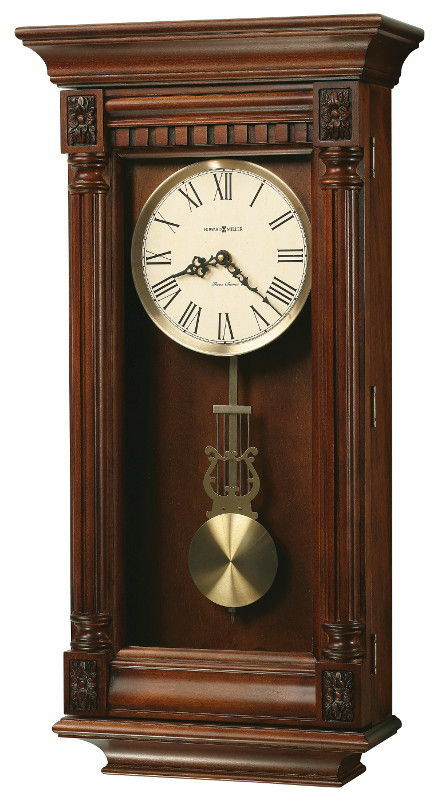 These flat-top wooden wall clocks feature a unique fret cut grill over plain glass, turned columns, and decorative top molding. Circular brushed brass-finished pendulum bob suspended on a wood stick. These elongated, 49" high wall clocks feature carved accents and a turned urn finial which complement the unique style. The aged dial offers black Roman numerals and decorative black hands, and a convex glass crystal. The wooden stick pendulum features an antique brass-finished spun bob. 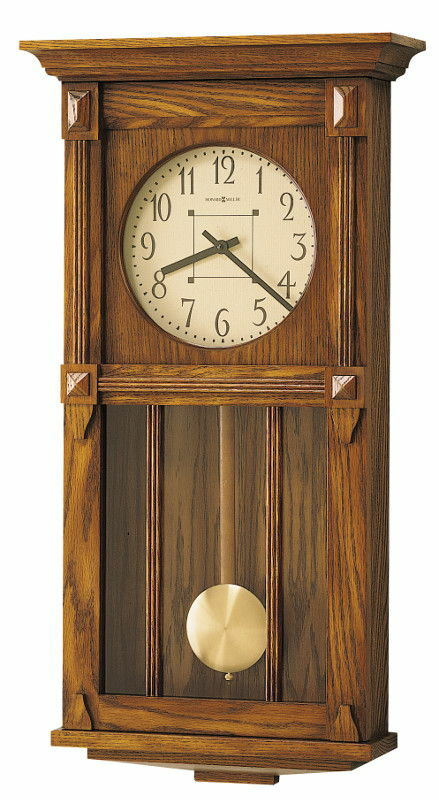 These chiming wall clocks feature inverted V-matched teak wood veneer on the front of the case, fluted columns, and gold detail on the flat glass front. Circular brushed brass-finished grid pendulum. The off-white dial features black Roman numerals, a brushed brass-tone bezel, and black serpentine hour and minute hands. These contemporary wall clocks feature brushed aluminum corners and polished silver-tone accents which complement the faux Macassar Ebony finished top and base. The brushed aluminum dial features an applied circular, brushed aluminum numeral ring with black Roman numerals and hour markers. A simple, rectangular pendulum is located under the dial and finished in brushed silver. This wall clocks contemporary style boasts a contrasting decorative burl back panel, with brushed nickel-finished bezel and grid pendulum. The elegant curved glass front presents the off-white dial with black Roman numeral graphics and hour markers with a brushed nickel-finished bezel and hands. Quartz, dual-chime German Kieninger movement plays full Westminster or Ave Maria chimes with strike on the hour, with optional 4/4 chime feature which plays 1/4, 1/2, and 3/4 chimes accordingly. These fashionable chiming wall clocks have quality features. The white dial is surrounded by a brushed nickel-finished bezel and offers embossed, brushed nickel-finished Arabic numerals. Features an arched bonnet and lower door molding. Off-white Roman numeral dial offers serpentine hands. Gold tone designs accent the door glass which frames a polished brass-finished pendulum with a beautiful lyre. Open the front door for easy access to change the batteries or set the time. Reeded columns offer brass-finished column caps. Gold tone designs accent the door glass which frames a polished brass-finished pendulum with a beautiful lyre. Open the front door for easy access to change the batteries or set the time. Reeded columns offer wooden-finished column caps. These chiming wall clocks offer both substance and charm. The gently scalloped arched bonnet is supported by reeded columns with artfully turned caps. Behind the opening door, the off-white dial features black Arabic numerals and black serpentine hour and minute hands. A polished brass-finished lyre and bezel provide the perfect accents to the warm wood case. 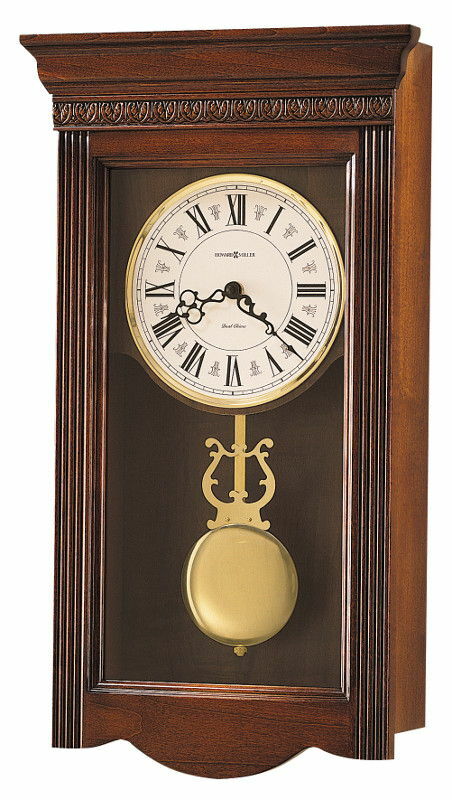 These chiming wall clocks offer a classic look with its swan neck pediment, turned finial, and reeded columns with turned column caps. The off-white dial showcases black Roman numerals and a raised polished brass-finished outer edge. Polished brass-finish continues within the case with a polished brass-finished pendulum and lyre. Quartz, battery-operated, triple-chime Harmonic movement. Plays choice of full Westminster or Ave Maria chimes with strike on the hour with 1/4, 1/2, and 3/4 chimes accordingly; Westminster chime and strike on the hour only; or Bim Bam chime on the hour only. Howard Miller Malia Wall Clock 625-466 is finished in Cherry Bordeaux on select hardwoods and veneers. 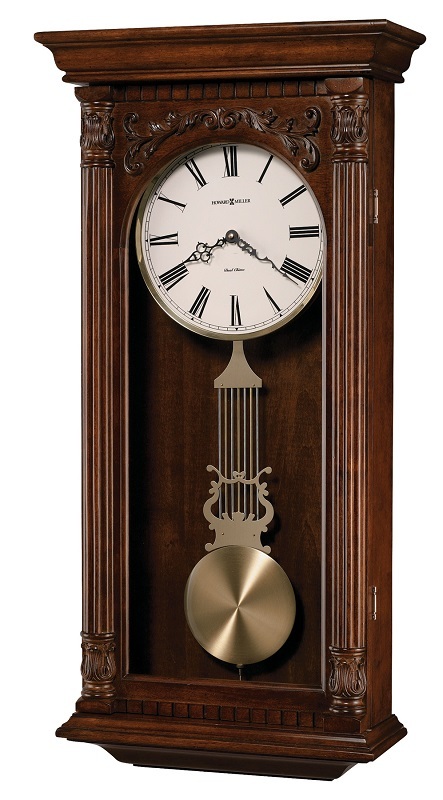 These wall clocks feature a swan-neck pediment with turned wood finial, decorative shell carving and reeded columns. Plays Westminster chime and strikes on the hour. 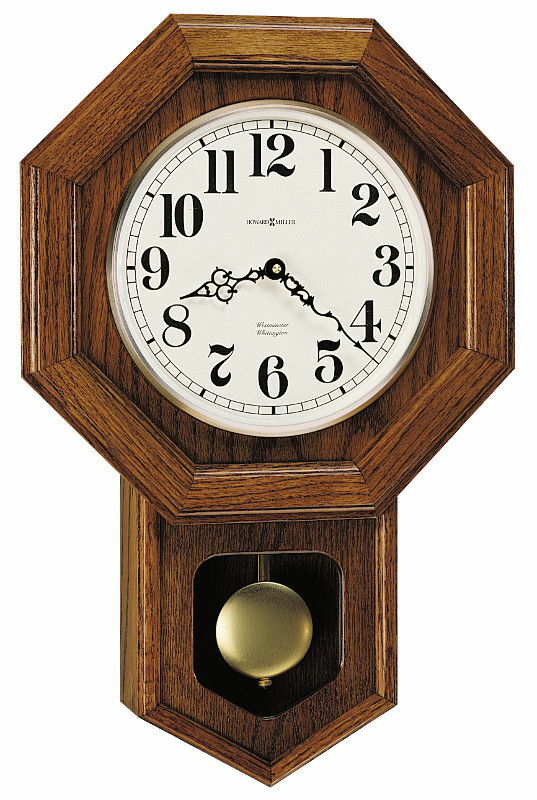 These chiming wall clocks are crafted with simple elegance. A pair of carved shell overlays and a wood bezel with a convex glass crystal. The aged antique dial features black Roman numerals and classic spade hands. 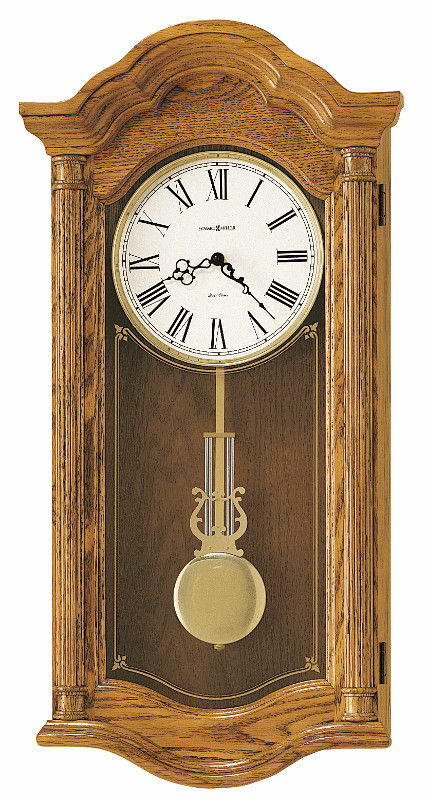 A gold-tone design detailing on the lower glass draws attention to the wood and brass-finished pendulum, which glistens against a back panel finished to match the case. The glass is framed by reeded columns with carved rosettes, and the base features a distinctive tiered profile. The off-white dial features black Arabic numerals and spade hands, and convex glass crystal. These wall clocks feature soft, rounded corners on the fully molded base, with a flared, molded bonnet. Finished in Oak Yorkshire on select hardwoods and veneers. Reeded corner columns and a polished brass pull enhance the door. The lamb's wool dial features black Arabic numerals, decorative corner accents, black serpentine hands, and glass crystal. A polished brass-finished bob on a wooden pendulum. These wall clocks have an off-white upper dial with black Arabic numerals and black spade hour and minute hands and convex glass crystal. The lower dial is off-white and features a thermometer, barometer and seconds movement. An antique brass-finished pendulum is visible through an oval window in the case. Requires two C and one AA sized battery (not included). The cream colored Roman numeral dial offers a raised polished brass-finished center ring and a polished brass-finished bezel. Contoured glass panel features decorative black accents. Finished in Windsor Cherry on select hardwoods and veneers and features light distressing. Roman numeral dial offers a raised, polished brass-finished center ring and bezel. Imprinted pendulum features a polished brass-finished outer ring. Requires three AA sized battery (not included). White dial with black Arabic numerals, hour markers, and hands, surrounded by a polished nickel finished bezel. A contemporary nickel finished, cylindrical pendulum hangs below. Quartz, battery-operated, dual-chime German Kieninger movement. Plays full Westminster or Ave Maria chimes with strike on the hour, with optional 4/4 chime feature which plays 1/4, 1/2, and 3/4 chimes accordingly. Features a deep, octagon-shaped molding that accentuates the dial. Off-white Arabic numeral dial offers polished brass-finished tone bezel, decorative hands, and convex glass crystal. Polished brass-finished lyre pendulum is framed with a gold tone “Regulator” inscribed on the front glass. Base features a distinctive, multiple profile. These wall clocks offer an Acanthus leaf molding on the pediment and base with reeded columns accenting the sides. The cream dial features dark brown numerals and hands. Decorative, wooden moldings frame the dial. 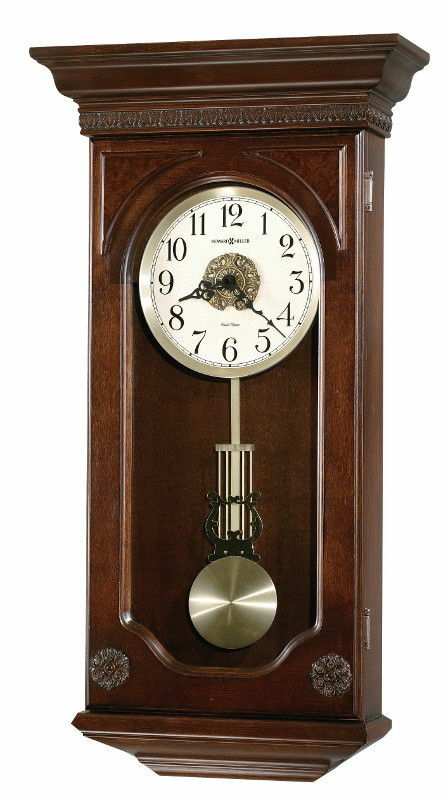 These chiming wall clocks offer a decorative overlay above the arched glass. Dentil molding accents the pediment and base. Reeded columns with carved acanthus top and bottom caps frame the door. A lamb’s wool dial features a brushed brass-finished bezel and Roman numerals. Serpentine hands add a sophisticated flair. The brushed brass-finished lyre pendulum swings below The hinged front door opens for easy access to change the batteries or set the time. Finished in Worn Black with red and brown undertones on select hardwoods and veneers. 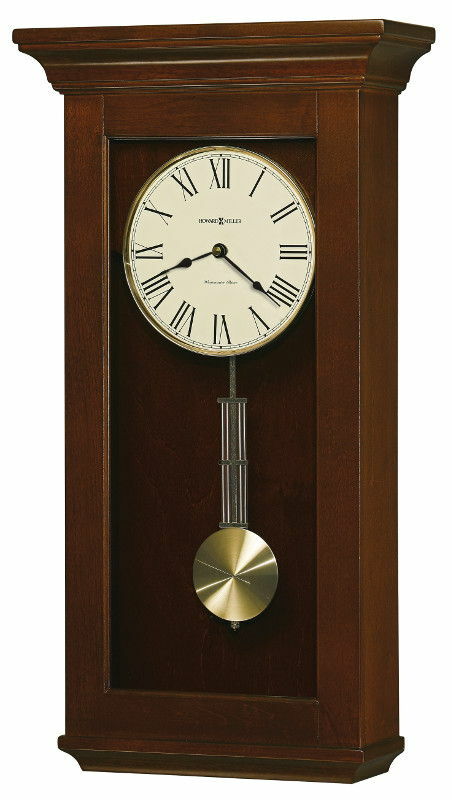 The handsome wall clock features fluted columns with raised beveled column caps. Flat glass that encases the dial. Brushed antique brass-finished pendulum bob with brass-finished harp and lyre. Plays Westminster chime on the hour and counts the hour.